Summary: Is it dangerous to drive while wearing flip-flops? 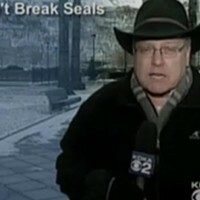 Reporter: Brenda Waters, KDKA Channel 2 Airtime: 2 minutes, 38 seconds on June 11 Highlights: * When anchor Ken Rice opens, "Police now say the driver who hit and killed a bicyclist a few weeks ago was distracted because his flip-flops got tangled up in the pedals of his truck." * When Rice posits, "During the summer, a lot of people wear flip-flops while they drive. So are they dangerous to drive in, or was this just a freak accident?" * When Waters informs us, "Although it isn't against the law to drive while wearing flip-flops, it is not recommended, and here are some reasons why ... " * Waters, as she narrates to footage of flip-flopped pedestrians, "Flip-flops are one of the most popular types of casual shoes, especially during the summer months, and they are worn just about everywhere, even behind the wheel of a vehicle." * When Waters interrogates a woman by observing, "I see you're wearing flip-flops." The woman agrees: "Yes, I am." Waters asks, "Do you drive with them?" She answers, "Yes." Waters presses: "How often?" The woman, who seems to be tiring of the questioning, says, "This is the first time this week." Waters continues, "Have you ever had a problem while driving with them?" The woman asserts, "No, never." * When a young man who admits to wearing flip-flops speculates, "I could see how it could be a problem, yeah. I could see it, you know, causing some struggle down there." * When Tim Skraitz, a driving instructor who founded "Drive to Stay Alive," explains, "[O]ftentimes, if the shoe does become dislodged, it can roll ... and stick in the accelerator, causing the accelerator to stick. ... If the sandal does come off, or if they step on either the brake or the accelerator very hard, the sandal can actually curl up and become lodged between the brake pedal and the accelerator, or the accelerator and the engine wall." Unanswered Question: So, was it a freak accident? What We Learned: It seems like no one cares about escalators and Crocs anymore. News Value: 3. Vilifying the flip-flop? What happened was a tragedy, though this incident is the exception, rather than the rule. Still, if we're going to make the flip-flop look bad, let's really do it up! Not only are they bad for your feet, but most flip-flops are made from petroleum-based polyurethane, and they aren't very recyclable.